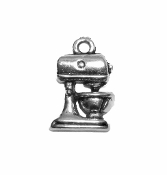 If you love your mixer like we love ours, you'll want this on your charm braclet! It is silver in color. It is not real silver, but it is real awesome!